I’m back in Joburg, recovering from jet lag. Since I had to leave for the U.S. in such a rush last month, I didn’t get the chance to share all the stories from my road trip around South Africa. So even though it’s technically old news, I hope you’ll enjoy this post about my recent visit to the magical village of Hogsback. 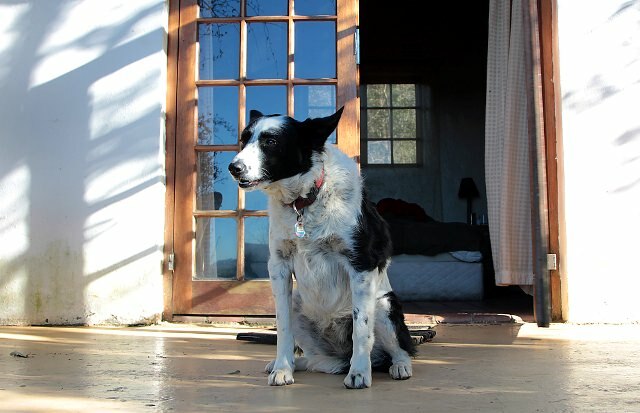 A slightly edited version of the post appeared on TravelWrite.co.za – you’ll notice it has more of a travel-magazine-y feel than my other posts. Thanks to TravelWrite editor Caroline Hurry for coming up with this clever headline. It’s a chilly morning in Hogsback. Joe and I just finished a pre-breakfast hike to a majestic waterfall at the top of a mountain. We’re hungry. We are the only customers in the quirky Butterfly Bistro, sitting at a cozy table next to a clay fireplace. “I’d like the cheddar-melt fillet, please,” Joe announces. I look at him quizzically. Who orders a steak at 9:00 a.m.? 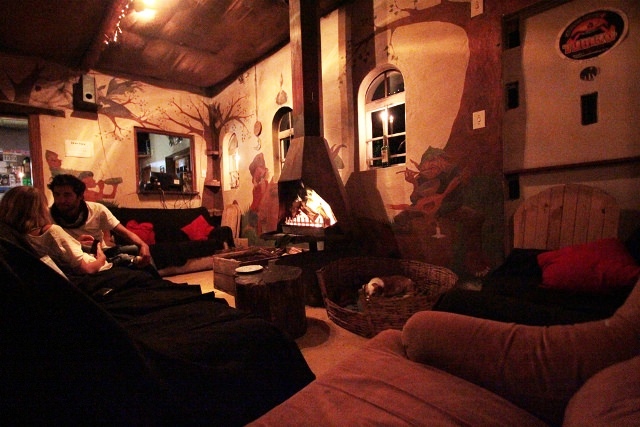 The Butterfly Bistro, one of several eclectic restaurants in Hogsback. Photo coutesy of Joe. Hogsback — part farming village, part hippy commune, part charming tourist trap – feels far away from the rest of South Africa. Nestled in the misty foothills of the Amatola Mountains in Eastern Cape Province, it reminds me of a sleepy town in Virginia’s Blue Ridge. 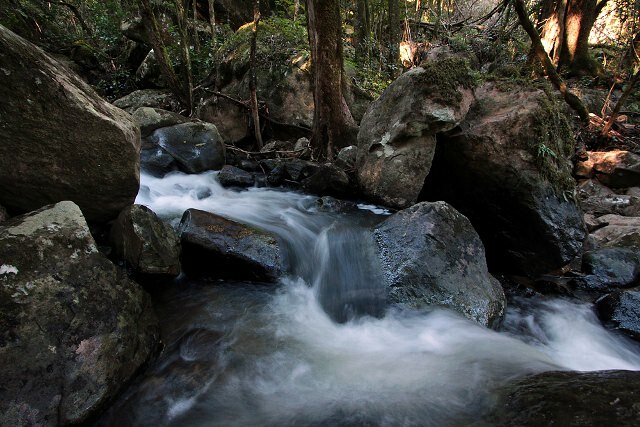 Hogsback’s waterfalls and ancient forests supposedly inspired the setting of J.R.R. Tolkien’s The Lord of the Rings. 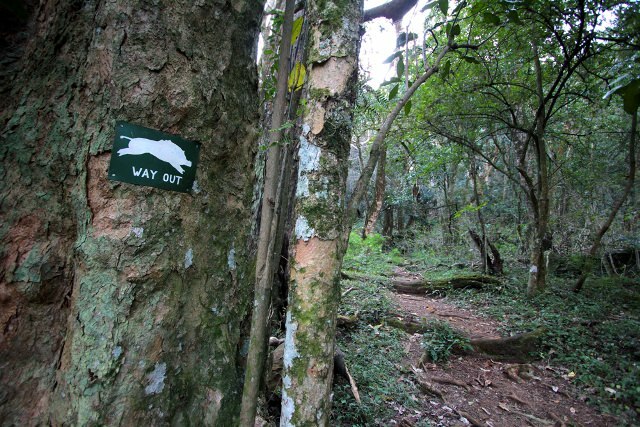 The biggest of Hogsback’s signature mountain trio resembles a hog’s back. The Hog trio, as seen from a tree house at Away With the Fairies Backpackers. 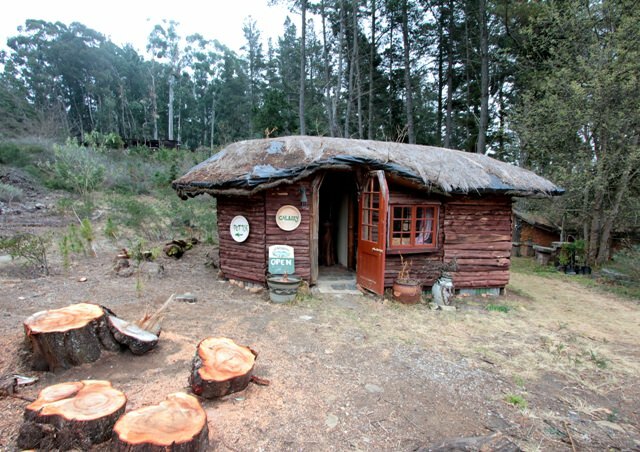 A few hours before reaching Hogsback (we were on a road trip between Durban and Port Elizabeth and had a couple of days to kill), I open my Rough Guide South Africa and pick out a backpackers’ lodge called Away With the Fairies. We’re not really backpackers but decide to try it anyway. The price is right at R350 ($50) per night. We arrive at Away With the Fairies after dark, to a reception desk that doubles as a bar. A young couple lounges, horizontally, on the sofa in front of the fire. The stereo blasts Red Hot Chili Peppers. Joe, who usually prefers quiet B&Bs, looks dazed. I briefly wonder if we’ve bitten off more than we can chew. But once my eyes adjust to the semi-darkness, I love the place. The lounge at Away With the Fairies, complete with fairy murals on the walls and a three-legged Jack Russell in the dog basket. We feast on Thai-style cottage pie prepared by a Scottish cook named Stew. 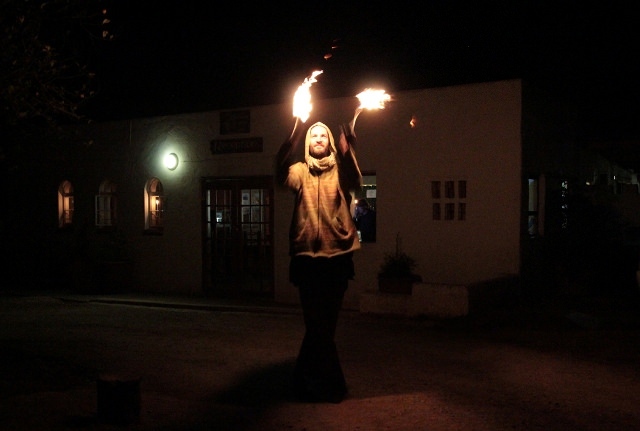 After dinner we’re treated to an impromptu fire-dancing show. 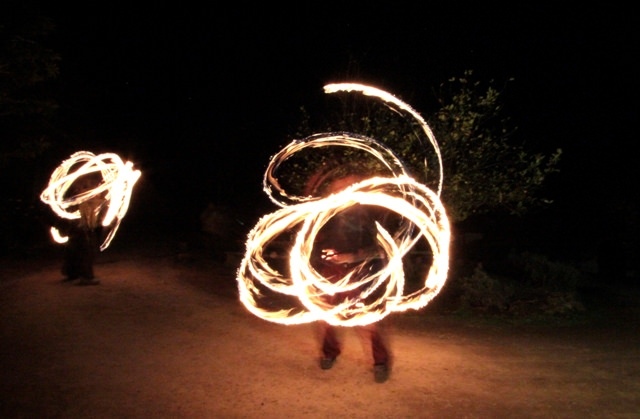 Fire-dancing at Away With the Fairies. 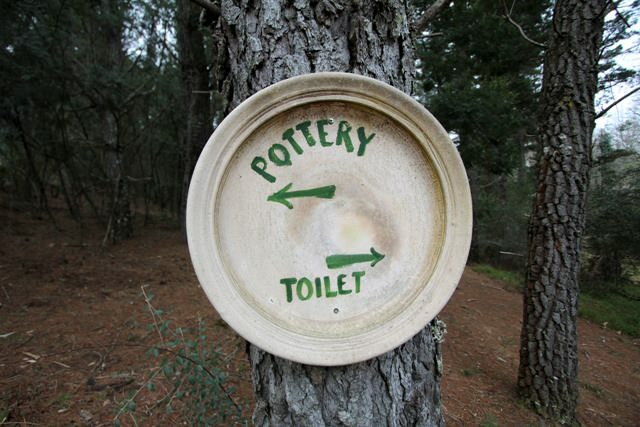 Away With the Fairies offers hostel-style lodging and en-suite cottages. We’re in a cottage called Frodo’s Rest, a spare but comfortable room with a queen-sized bed, full bath, and fireplace. When we discover the view the next morning, we know we’ve chosen the right place. Hogsback Mountain from just outside Frodo’s Rest. Flo the dog likes to hang out in front of our house. Time moves slowly in Hogsback. Around mid-morning, we breakfast on poached eggs and crostini in the courtyard of Feathers, a restaurant/art gallery/gift shop that also hosts a weekly organic market. Today is market day. We sip strong coffee and watch farm kids cavort in knee-high wellies while their dreadlocked parents sell bread, cheese, and fresh produce to a trickle of customers. 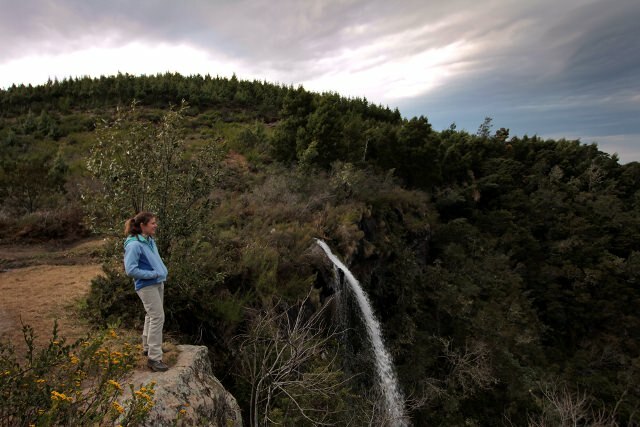 Feathers’ owner Alex Frenkel tells us about Hogsback Guides, a community initiative in which local villagers take tourists on nature hikes around Hogsback. Right up our alley, and affordable at R75 ($10.50) for an hour-long hike. We book for the next morning. We spend that afternoon wandering in the forest. There is a trailhead outside Frodo’s Rest that leads down a steep hill into a thickly wooded valley. We marvel at the towering 500-year-old trees and I feel like I’m in Tolkien’s Forest of Fanghorn. I half expect the trees to address us in deep booming voices. Swallowtail Falls, one of many lovely waterfalls in the forest. Thank goodness for these hog trail markers. It’s a beautiful forest but not the kind of place you want to get lost in. Admiring the view from Kettlespout Falls. Photo courtesy of Joe. 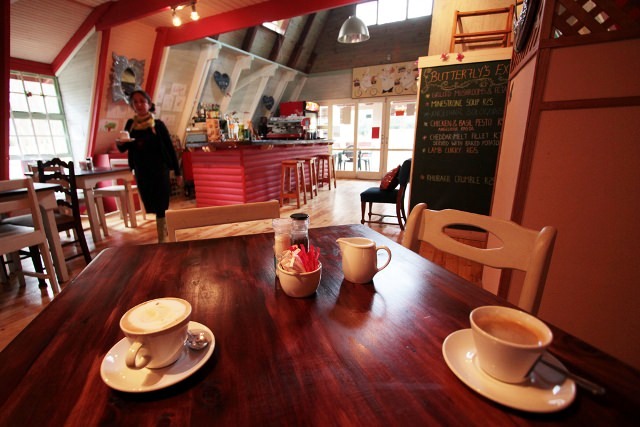 Our last stop in Hogsback is Starways Art Centre. 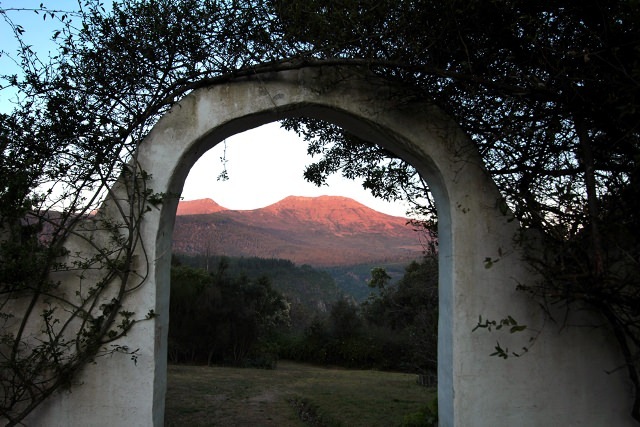 Starways, founded by potter Anton van der Merwe and his opera-singer wife Gwyneth Lloyd, is a Hogsback must-see. 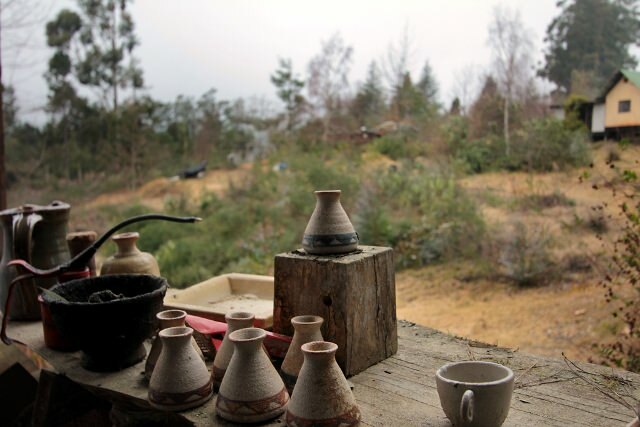 It’s situated at the end of a long dirt road, with a small gallery, a theatre, and an open-air pottery workshop overlooking the misty hills. Anton’s pottery is stunning and even I could afford a couple of small pieces. Just one of the many buildings at Starways. Seriously, I think a hobbit lives in there. Pottery drying at Starways Arts Centre. We drag it out as long as possible, but eventually it’s time to leave Hogsback. We drive slowly down the mountain. Soon the mist burns off and we’re on a sunny highway headed toward Port Elizabeth. It looks and feels like Africa again. 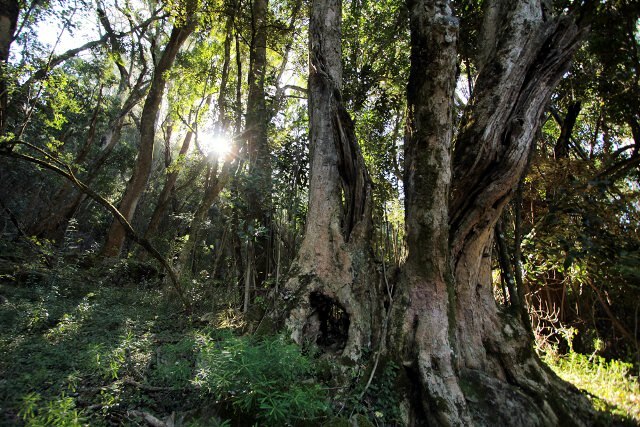 Was Hogsback a dream? 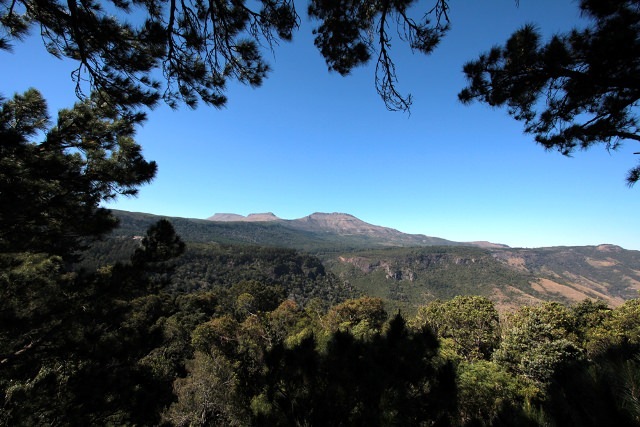 I have always heard great things about Hogsback but have never been there – so thank you for the great post. I love your photo of the Swallow Tail Falls – just beautiful. Thanks Jackie. Hogsback has so much to do considering what a small town it is. Definitely worth a visit if you’re ever passing through that area. Yes, I’ve heard there’s no truth to the rumor. But I like to imagine it’s true. What a great post, Heather. I think this is one of your best! The photo of the fire painting is amazing. I want to visit Hogsback! Thanks so much Kathy. That’s very nice of you to say. Hogsback was pretty awesome and I’ve heard it’s even more beautiful later in spring, when all the flowers are blooming. I hope we got to go back again someday. Love all your pix Heather and thanks for your kind comment about my headline writing abilities! Aah…I was lost in Hogsback for a few moments there…wish I could have stayed all day. Alas, work beckons. Lovely post Heather, thanks. Thanks Jane, glad you enjoyed it! My parents went on their honeymoon to the Hogsback…they are celebrating their 40 year anniversary next year, so we are all going as a family…we cannot wait! Cool! You’ll have a great time.